"There's a real concern that the MERS coronavirus could escape broadly when millions of people visit Saudi Arabia for the Hajj," said Mark Denison, M.D., Craig-Weaver Professor of Pediatrics and professor of Pathology, Microbiology and Immunology at Vanderbilt University School of Medicine. Denison's longtime collaborator Ralph Baric, Ph.D., at the University of North Carolina and his team demonstrated that GS-5734 inhibits SARS-coronavirus and MERS-coronavirus replication in multiple in vitro systems, including cultures of primary human airway epithelial cells, which are the cells infected by respiratory coronaviruses. The researchers also showed that GS-5734 was effective against a circulating human coronavirus, bat coronaviruses, and bat coronaviruses that are considered "prepandemic" because they can infect cultured human cells. 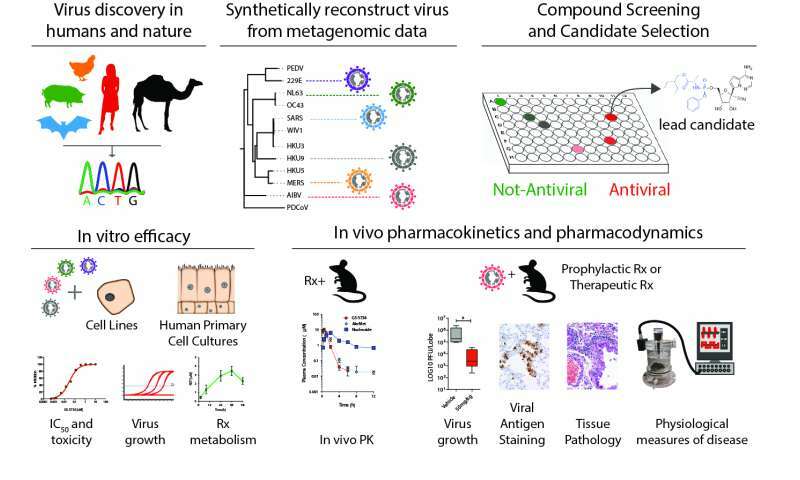 "This compound shows broad activity against a variety of human and animal coronaviruses and represents an exciting potential therapeutic for a family of viruses prone to emergence from animal reservoirs," Denison said. Denison and his team at Vanderbilt will continue to use the compound "as a probe to try to understand the biology of the virus, how and why this drug works, and to identify new targets for inhibiting coronaviruses," he said. "This is an exciting example of how pursuing fundamental research to understand the mechanisms of virus replication and pathogenesis can lead to an important compound with therapeutic potential." The research also illustrates the power of long-term collaborations and of public-private partnerships, Denison said. Denison and Baric have collaborated for 17 years to study coronavirus biology. Their efforts to identify coronavirus antiviral drugs in cooperation with Gilead Sciences have been supported by the Antiviral Drug Discovery and Development Center, which is funded by the National Institutes of Health (grant AI109680) and directed by Richard Whitley, M.D., at the University of Alabama at Birmingham. Very cool stuff. Since the kinds of resistance mechanisms available to bacteria are not present in viruses, we should see in the next decade or so the elimination of much of the scourge of viral disease. I heard it said once that the way to fame and fortune was to cure the common cold. Is that day almost here?